Everything you need to know about selecting the right PMS for your property. A PMS can play a critical role in enhancing the guest experience. 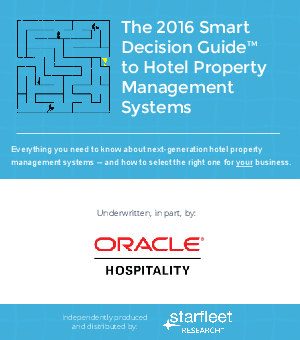 Different hoteliers have different expectations of a property management system. Hoteliers are constantly searching for ways to improve the guest experience and increase guest loyalty. This unbiased, fact-based guide provides an invaluable resource for hoteliers in need of the latest technology trends, insights and recommendations for streamlining hotel or resort operations and increasing occupancy, revenues and profitability.